A Coretta Scott King Award Honor book Black Hands, White Sails describes the nineteenth century whaling industry, focusing on African-Americans whalers. Although the whaling industry began before slavery ended in the United States, many free African-Americans took jobs on whaling ships, since racial prejudice often precluded them from safer, higher paying land-bound jobs. Patricia and Frederick McKissack explore all aspects of the whaling industry–from the technology, to the people involved, to some terrifying catastrophes and survival stories–while also putting the events in context with the American Revolution and the development and eventual abolition of slavery in the United States. This book is fascinating, but dense enough to interest middle grade, teen, and adult readers more than young readers. If you liked Black Hands, White Sails and have the stomach for a more gruesome story, you should check out Revenge of the Whale by Nathaniel Philbrick–another nonfiction book about the whaling industry. You may also enjoy The Longitude Prize by Joan Dash. This entry was posted in History, J History, J Nonfiction, Juvenile, Non-Fiction, YA History, YA Nonfiction, Young Adult. In the late 1800s, Bass Reeves was one of the most famous lawmen in the Indian Territory (now Oklahoma). Though many gunmen—outlaws and lawmen alike—were known for their ruthlessness and deadly accuracy with a weapon, Bass Reeves was known for his strict sense of justice and duty, and he never killed a man unless he had to. He was both feared and respected by the men and women he arrested, despite the fact that many white men and women in this time period were hesitant to respect African Americans in positions of power. Bad News for Outlaws tells the story of Bass Reeves’ life and career in the style of a Western. Although in the format of a picture book, this book will be enjoyed most by upper-elementary age readers who enjoy history and tales of the Old West. The book won a Coretta Scott King Book Award in 2010 and appears on the Virginia Reader’s Choice Award list for 2012-2013. If you find these real-life sea monsters fascinating, you will definitely want to check out this new non-fiction book. 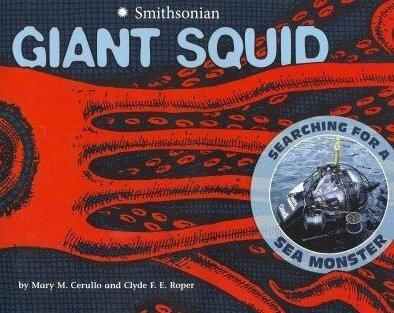 Written for an upper-elementary age audience, Giant Squid shares facts about the giant squid and its biology as well as exploring the history of scientific knowledge about the giant squid and the legends that once grew up around the enormous sea creature. The book has many illustrations and photographs (some of them fantastically gross!) and may appeal to reluctant readers. I highly recommend it! This entry was posted in J Animals, J Nonfiction, J Science, Juvenile. Created as a companion to the motion picture, The World of the Hunger Games discusses some of the characters and themes from the books coupled with abundant movie stills from the film. In truth, the book is mostly pictures. As someone who has both read the books and seen the films, the companion did not provide me with much additional information. I had hoped to find some discussion of how the filmmakers transformed the world of Panem from page to screen, but the book did not approach that subject. For someone who has not read the books, however, this guide could be incredibly valuable to help fill in any gaps that the film left in terms of plot and character development. This entry was posted in J Film, J Nonfiction, Juvenile, YA Film, YA Nonfiction, Young Adult. In a mixture of narrative prose and comics, Duped! shares several short stories of some of the world’s biggest and most infamous con artists. Whether fabricating an alien invasion so believably that thousands of people fled their homes or convincing the world’s most prominent scientists and journalists to study a fake ancient tribe in the Phillipines for almost ten years–the men and women in this book were clever enough to fool even the most intelligent of people and in some cases, cheat them out of millions of dollars. Personally, I found this book fascinating! It will likely appeal to kids and teens in grades 4 and up, particularly those who like stories about con artists and strange-but-true events. If you liked Duped!, you might like The Giant and How He Humbugged America.